I am very busy with my research, but nevertheless I am posting more pictures. Please let me know what you think of these? Thanks again for posting those wonderful pictures. I am very intrigued about the last four swords on the right of the first picture... especially the last one with the wide guard. What are those exactly ? Do you know from what time period they are (late seventeen century ? ), and what is their purpose ? 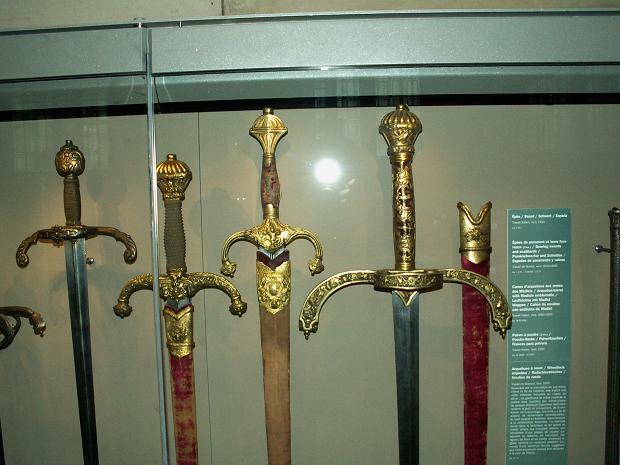 Parade / court swords ? Any information would be welcome. 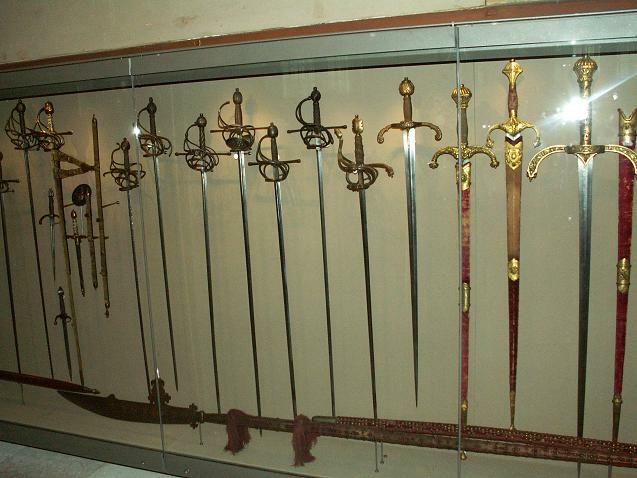 They are bearing swords from 1610-1620. Made in Venice. 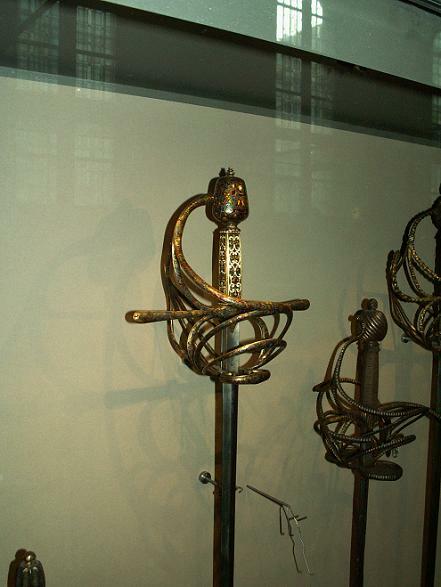 The three on the right are the bearing swords. Was this your question? Not too far away from my guess (from my perspective of course ), looks like I'm getting a little better at this. Yes it was, thanks for the quick answer. 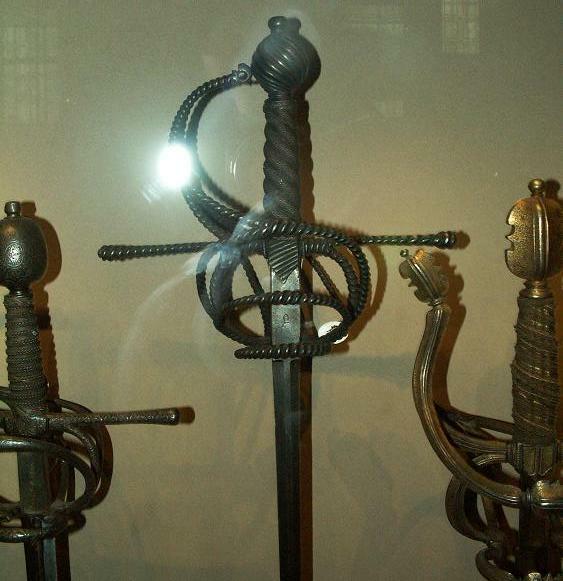 You said that the three on the right are the bearing swords... now, another question : how would you qualify the sword between those three and the nice rapier with bronze-ish hilt ? Isn't that also some kind of bearing sword ? Or is there another name for this kind of sword that I'm not aware of... ? I like the "tête de violon" quillons on this one. Edit : it seems one of the rapiers on the left has its suspension system intact... very interesting. That sword is not a bearing sword. 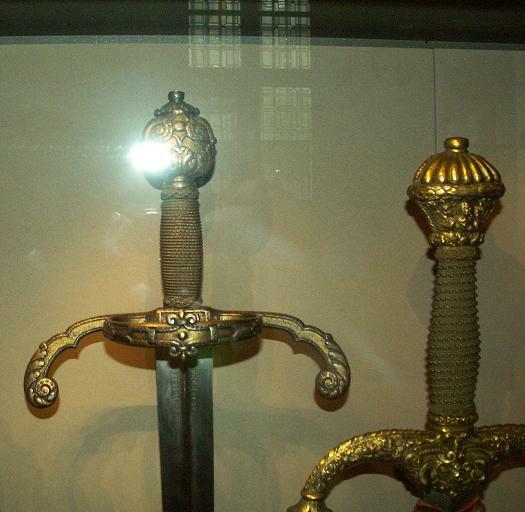 That is described as a sword made in Italy in 1550. Look at the close-up of the blade. It is inscribed with Federico Figinino, obviously an Italian name. Does anyone have any informatopn on this swordmaker? Look at the blade, it seems to have a midrib? 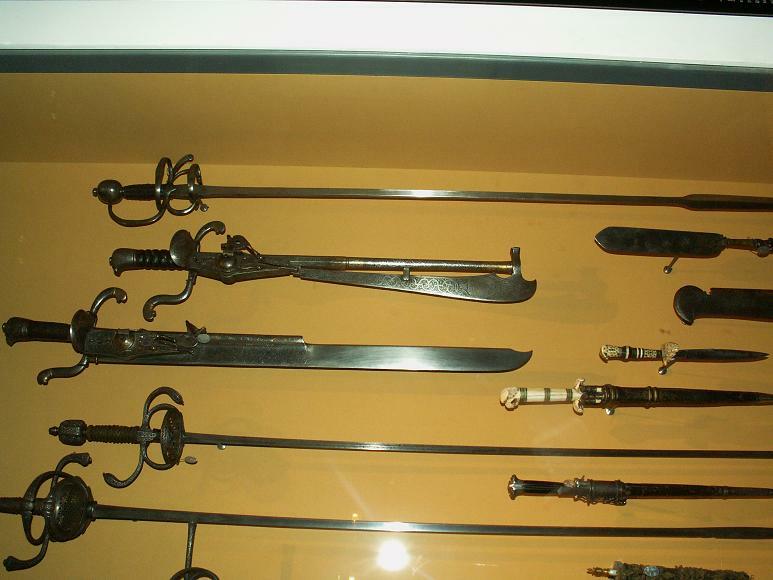 I need informations about a rapier you have photographated in the Musée de l'Armée. I found a photo of this rapier in the album "antique arms and armour". 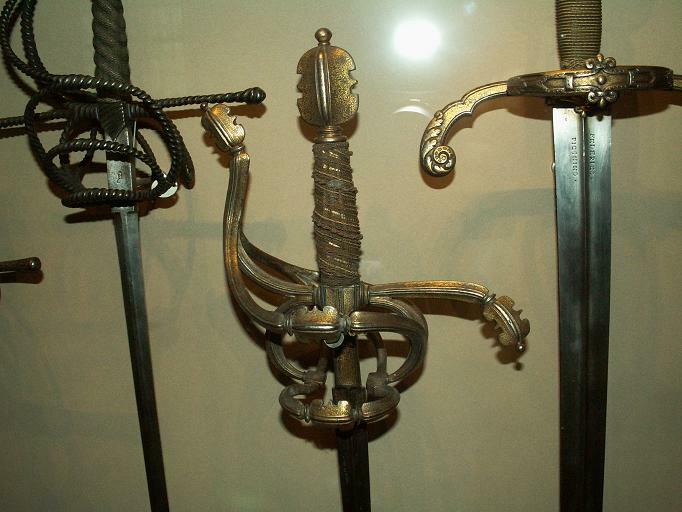 I have found a photo, on web, of this rapier with others, took at the Musée de l'Armée. The background looks like have changed, perhaps it's a new museum development. It's important for me to know the provenience, the date or other news about it: that sword is very similar to one I have found during the excavation of a tomb (I'm an archaeologist! ); I have seen that you have took photos also at the labels...perhaps you took a photo also at that one! or did you buy a catalogue? could you give me bibliographic informations about this? 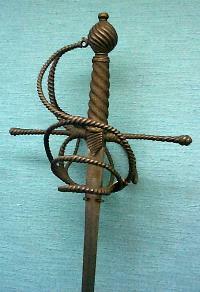 if it's possible, could you send me a better photo of the rapier than this one? Looking more closely, Elisa, I see that these are different weapons. 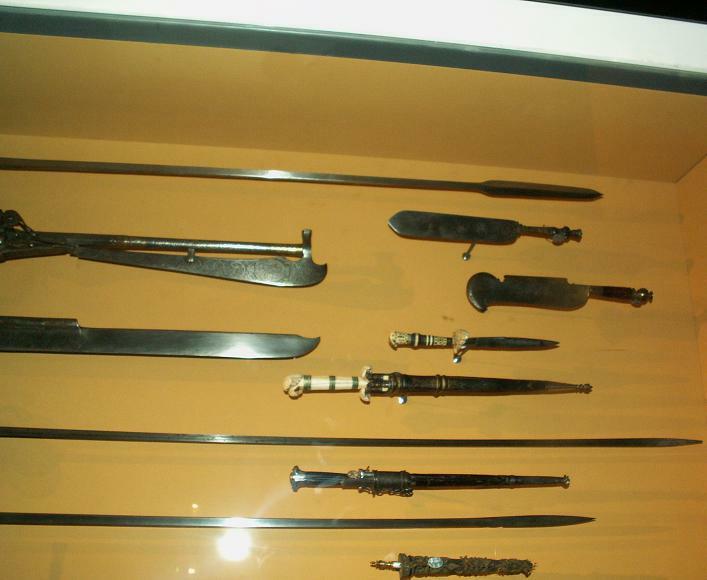 The grip treatment is different, the pommels are of slightly different shapes and the Musee de l'Armee example lacks the long quillons of the first weapon you posted. They are almost certainly of the same period, though, which I will guess as 1580-1620. They might even be made by the same hand. 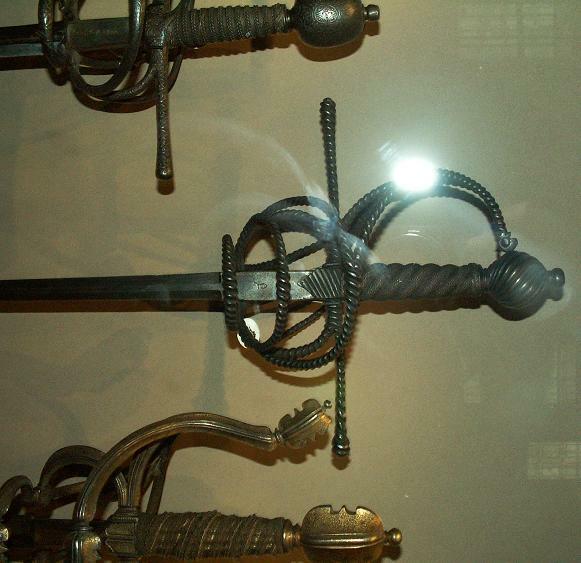 these are the photograph I have found of this rapier, and I think are the same rapier, have a looK! He was Jean Louis de Nogaret de Valette, a courtier of Henri III. The intimate circle of Henri III's favourites was known as "le mingons," or "the dainty ones," and it was widely believed there was a homosexual element to this court just as there was during the rule of James I in England. It was said of them: '"they wear their hair long, curled and recurled by artifice, with little bonnets of velvet on top of it like whores in the brothels, and the ruffles on their linen shirts are of starched finery and one half foot long so that their heads look like St. John's on a platter." He opposed the accession of Henri IV and was active in political plots during his lifetime. I'm always interested in learning about the identities of the men who wore the armours in museums - otherwise they're just empty shells. One of my favorite pieces from that museum is this cuirassier's harness, which belonged to the Swiss soldier Pierre "Sillyface" Bruner. "I want the helmet to be covered in ventilation holes," he must have said to the armourer - "and give it a silly face. I want my enemies to laugh before I kill them." I just spent my morning reading through the thread and the least I can say is that I am inspired to make some nice stuff this year and I thought it deserves a bump for those that may have missed it.